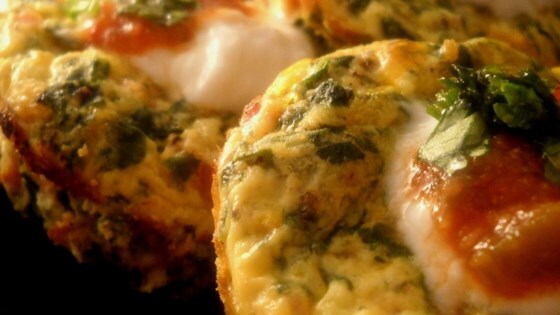 "Muffin-sized perky spinach frittatas. They are fun to make and even the kids love them! Accompany this dish with tortilla chips and salsa - makes for a great treat! Use egg substitute in place of the eggs to make this an even healthier treat." I made this in a baking pan instead of muffin cups and it was great. I cooked it at the suggested temp for about 40 minutes, until set. I would also use less cumin next time I make it.